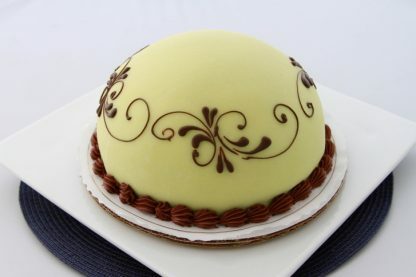 If we had to pick one cake Copenhagen Bakery is known for it would be our Princess Cake. Our Princess cake is by far the most popular cake we sell. Start your online order below by picking the size of Princess Cake you want. We deliver around the Bay Area or pick up your Princess cake at our Bakery & Cafe. Tell us what you want to be written on your cake, pay online, and we’ll start processing your order. Please allow 12-24 hours processing time for most online orders. One of our most popular cakes. An edible image can be printed on some cakes. Princess Cake: Gold cake filled with custard, a thin layer of raspberry, and whip cream. Iced with whipped cream and marzipan. The Marzipan is colored green or can be the natural off-white, or pink! This is one of our most popular cakes! Also available by the slice.